Watercress plant, Nasturtium officinale, is an attractive bitter salad herb. Ideal to grow in pot near back door. Use in salads, sandwiches, soups or as garnish. A rich source Vitamins A, C and iodine. Leaves used as a general spring tonic and to treat scurry. Approved by German Commission E as a remedy for bronchitis and coughs. 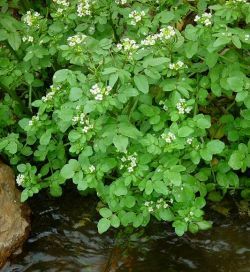 Watercress plant is a native of Europe and Russia and prefers well-limed moist soils in a cool, protected position with filtered light. Small white flowers in spring and summer. Frost resistant but drought tender. A creeping perennial to 0.45m x 0.6m. Be the first to review “Watercress, plant” Click here to cancel reply.